The family of a man who experienced heart pain while swimming laps at the YMCA is suing the organization, alleging that lifeguards ignored the 61-year-old man for more than five minutes while he was submerged underwater. On May 28, Yosef Bornstein was swimming laps at an indoor pool at the Leaning Tower YMCA in Niles, Illinois, when he suffered heart pain and became submerged underwater, according to a complaint filed on June 8 in Cook County. Bornstein was submerged for more than five minutes "in full view of the lifeguards," according to the lawsuit. 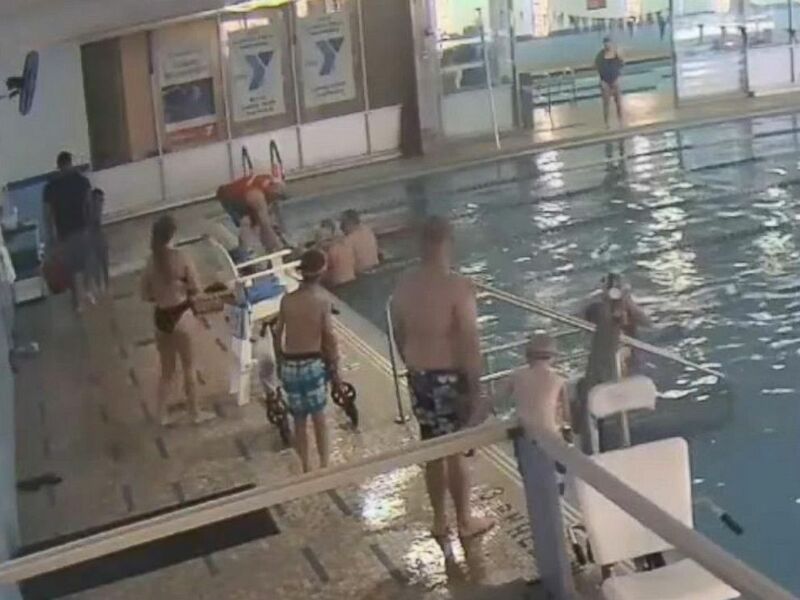 The lawsuit alleges that the YMCA of Metropolitan Chicago was negligent because the lifeguards failed to observe Bornstein underwater and failed to provide immediate assistance to a person in distress in the water. The lawsuit also alleges that the YMCA failed to maintain lifeguard stations that provided clear, unobstructed views of the pool area and that the lifeguards failed to pull Bornstein from the water when they "knew or should have known that he was in distress and underwater." Two lifeguards were manning the indoor pool at the time of the incident, according to a release from the family attorney, Timothy Cavanagh. Bornstein is a longtime member of the YMCA, where he would swim regularly, according to the release. He remains hospitalized with brain injuries, which were sustained in the incident, the lawsuit states. The lawsuit is seeking damages in excess of the jurisdictional limit, plus costs. On June 12, Bornstein's attorneys filed an emergency motion to protect all materials having to do with the incident, including incident reports, surveillance video, witness statements, training manuals for lifeguards, and employee files and cellphones for the lifeguards, whether they were on or off duty. YMCA surveillance video of the incident shows Bornstein standing in chest-deep water before he goes underwater. After he'd been submerged for some time, another swimmer is seen attempting to assist Bornstein. Bornstein was at the bottom of the pool and unconscious when the swimmer discovered him, according to the release. The family of a 61-year-old man is suing the YMCA of Metro Chicago after they said lifeguards ignored him for five minutes while he had a heart attack in the swimming pool. A lifeguard is then seen jumping into the pool and pulling him out, and Bornstein receives CPR on the side of the pool. Cavanagh, along with Bornstein's son, held a press conference in Chicago Thursday after the surveillance video was released to the media. "With the summer swimming season underway, it is important that lifeguards receive proper training, are well supervised and do their jobs," Cavanagh said in the release. "Too many preventable accidents like this one occur because of negligence." The lifeguards at the scene were "immediately put on administrative leave," and a disciplinary review is underway, the YMCA of Metropolitan Chicago said in a statement. "Our hearts go out to the family of Yosef Bornstein, and we wish him a full and swift recovery," the YMCA statement read. "We want to assure all members that their health and safety is of primary importance." The YMCA said it continually reviews its policies and procedures -- including lifeguard training -- for best practices.